50 year old male with an initial chief complaint of neck, shoulder and mid-back pain with a pain level of 5 out of 10. The patient finds difficulty in performing his job as a truck driver, reaching overhead and turning his head. 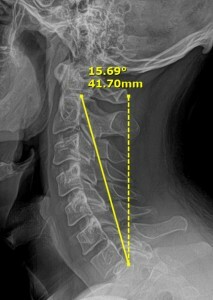 Exam shows limited neck motion with pain in all directions, and a pinched nerve at C6 and T5. 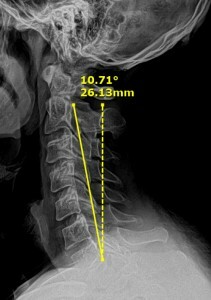 X-ray shows a loss of normal neck curve and a slumping posture. Treatment prescribed: 25 chiropractic adjustments, 12 deep tissue laser sessions, and 20 cervical decompression sessions. At his 3 month exam, he reported that he had a pain level of ZERO, on a 0 to 10 pain scale and his symptoms were gone. He now has full motion in his neck without pain. He has regained the ability to drive and reach without pain. X-ray shows the lateral neck curve restored thus reducing nerve pressure. Patient transitions to maintenance care to maintain his progress.